One of the most tragic and harrowing chapters of the WWII was the siege of Leningrad, now St. Petersburg, which lasted for almost 900 days. RT spoke to the survivors who unveiled the horrors of the deadliest siege in the history of warfare. For 872 days, from September 8, 1941 till January 27, 1944 people in the Russian city of Leningrad were encircled by Nazi forces, cut off from the rest of the country with no food or vital supplies. Though the total death toll is still unclear, estimates of the victims from the siege vary, with some numbering up to 1.5 million civilians. Svetlana, one of the survivors of the Leningrad siege was only 7 years old when the war broke out. Speaking to RT’s Madina Kochinova, she recalls her first encounter with death when she found her aunt frozen on the street. 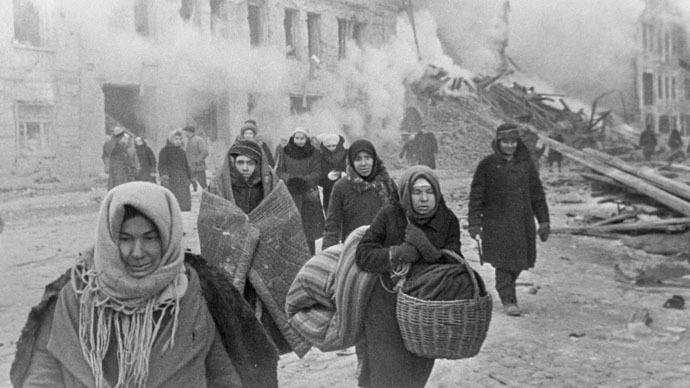 The city was heavily bombed while people were dying of starvation and extreme cold. The winter of 1941-42 saw temperatures plunge to 40C below zero. With no heating the entire water supply network had frozen solid. The only solution was to collect water from holes in ice in the frozen Neva River. “People wander around the city holding empty buckets search for water. There is no water, the pipes are frozen…” wrote Lubov Shaporina in a diary entry on January 6, 1942. People endured severe food shortages: a strict rationing system was in effect in the city, with individual daily food consumption limited to around 125 grams of bread. “The horror of the siege was how death became routine, in winter ’41-’42 people just collapsed and died on the streets,” Oleg Bushuev, the siege survivor, said according to iremember.ru website dedicated to WWII. Tatyana Korsakova, now 78, lived under the blockade for two years. In an interview with RT she recalls that death was in the air in the city. At one point the death toll peaked at 150,000 people a day, with those still alive forced to eat pets, rats or glue. Many people were driven to madness, while some resorted to cannibalism. “Cases of cannibalism started to appear. You walk down the street and you see a corpse, you walk back and see there is piece missing,” wrote Klavdiya Naumovna in a diary entry on February 22, 1942. As Hitler's army surrounded the area of around 5,000 square kilometers, cutting almost all road links to the city, the only way for supplies to reach the population was via a narrow and dangerous road on the frozen surface of Lake Ladoga - it became known as the "Road of Life." "Vehicles drove along one and the same track, and the ice became very thin and worn out, so we had to watch the traffic and the ice condition. The ice was repaired manually: we drilled holes and carried water to pour on the ice road. All the while the Germans were bombing us,” Vera Rogova, who served as a traffic officer on the Road of Life, told RT. Another witness of the siege, Svetlana Magaeva, said Nazi planes were constantly bombing the trucks on the lake, many of which were carrying children. "They didn’t care that those were the Red Cross trucks. In winter, the headlights of those drowned trucks were glowing and glowing until they finally went off. And in summer, we often saw children’s caps in the water,” Magaeva recalled in her book of memoirs. People looked for symbols to give them hope. Amid the suffering, people could hear the persistent beat of the so-called Leningrad metronome. It became a symbol of the people’s resistance to the siege. Broadcast through 1,500 speakers, a slow beat meant retreat, while a fast beat warned of an air raid. Another symbol of resistance and the will to victory was the legendary 7th Symphony composed by Dmitry Shostakovich who witnessed the horrific siege in the first year of the war. "My 7th Symphony was based on the formidable events of 1941," the composer said on an archive tape. "I dedicated my composition to the struggle against fascism, our forthcoming victory and my native city of Leningrad." The blockade of Leningrad is described as deliberate genocide by some historians. Over half a million people are buried in the Piskaryovskoe Memorial Cemetery, which is the main resting place for its victims. “The blockade was sudden and unexpected, as much as the war itself was unexpected for the country. There were no reserves of fuel, no food...” the siege witness, Russian writer Daniil Granin said in his speech at the German parliament in 2014. Watch RT’s documentary “Leningrad siege seen through survivors’ eyes” where survivors of the dramatic events retell the unimaginable suffering they endured.